Robert sent these photos in August 2004, saying, "I have just finished repainting my 3B a nice semi-gloss OD green and it looks great. This has been a labor of love, since the Jeep was given to me by my stepfather Marvin Burrows, who has since passed away. He didn't want me to 'ruin' the character of the Jeep when he gave it to me, so I sent him a picture of it before he died and he was extremely pleased that I gave it a new character; hence the name 'Marvin' for the Jeep as a tribute." Robert has done a neat job on original details such as the vacuum line and rearview mirror. 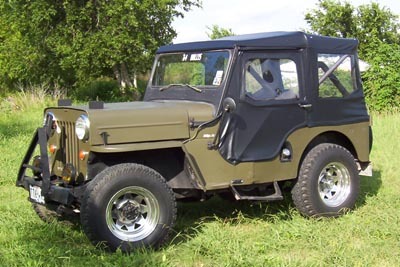 He decided to set them off with a unique "Willys" graphic, since by 1964 the Kaiser Corp. had removed the Willys stampings from Jeep tailgates, hoods and grilles. The spare tire is on a swing-down mount (80K JPEG). Robert restored both the 4-Wheel Drive stencil on the tailgate, and the 4WD system itself. He pulled the transmission and transfer case and rebuilt them, and says, "Never done this before -- it was a great experience." Note: Mike Perry's reproduction of the 4-Wheel Drive stencil is available for download on CJ3B.info. Robert comments that "The website is very enjoyable and useful." He continues, "I completely stripped the old paint off to the bare metal inside and out, painted the outside, and then used Herculiner roll-on bed liner for the inside, firewall, floor, and tops of the body rails. It came out great, tough and chemical resistant. I then installed 'real' seat belts (took the old airline-type belts out.)" "Only problem is the guy before my stepfather threw away the hard top. I purchased a Bestop full top and it turned out as you see it now. I think it turned out quite well, but I still have some cosmetic changes to make. "